Do you love espresso but hate having to measure out the exact amount of grounds, fill the porta-filter and tamp down each time, not to mention cleaning the filter out? In that case, you might want to use an espresso machine that can handle convenient pods. It’s just like K-cups that you can get for coffee but a machine that’s designed especially for espresso is the right way to go. The best pod espresso machine will make shots that are just as good as those similarly priced machines that only work with grounds that you pack into the filter. Some machines are Nespresso pod compatible and some are ESE pod compatible. Some can give you either an espresso or a lungo and some come with a frother to enable you to have a cappuccino or latte too. We’ll pick out the best of all and explain why they are so good below. These are specifically designed for espresso, so if you prefer regular coffee from pods, take a look at our picks for best pod coffee makers instead. If you want to see a few other well rated pod expresso machines available today, go to Amazon now! If you love the idea of Nespresso cups but don’t want to pay a lot of money for an incredibly cool designed espresso or lungo maker, the Nespresso Inissia Espresso Maker might be the perfect idea. 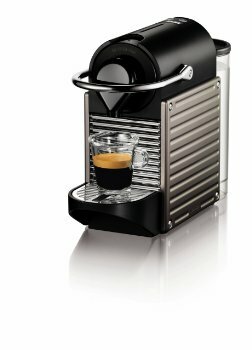 Although it is the lowest priced Nespresso maker on this list, the espresso it produces is as good as any, and its ease of use is second to none. You’ll even get a good crema over your espresso or lungo! This is a very small espresso unit that won’t take up much space on your counter, and it comes with a built-in handle so you can tote it to a picnic or camp site. There are several colorful designs, from red to white, grey to blue and black to steel. You won’t have any problem finding a color that matches your decor. It features a 24 ounce water tank with hot water ready in as little as 25 seconds, there are two buttons for a selection between espresso and lungo, and it will hold 9 to 11 used capsules before the bin needs to be emptied. You’ll get a high pressure 19 bar pump, a 9 minute automatic shut-off function, removable water tank for easy filling at the kitchen sink, and the drip tray drops down for larger or smaller mugs. If you want to make a mug of Americano coffee, just press the button again for the machine to dispense only hot water into the mug after the espresso or lungo was made. If an inexpensive, compact and energy efficient sized espresso maker is what you are looking for, this is the best espresso pod machine you can buy. The Nespresso Pixie Espresso Maker is the bigger sister to the Inissia and costs quite a bit more but you can fit a travel mug in the Pixie while you cannot with the Inissia. It has a very modern and well built type of look because the exterior features more metal while the Inissia is mostly plastic. The Pixie also made our list of best espresso machines under $300 overall, so you know that the use of pods doesn’t mean inferior espresso results. The biggest difference between the two is the back-lit low water alert that comes on when you need to refill the tank but there are no other design colors to choose from except black or black and grey. You’ll get virtually the same type of features as it’s little sister, including a 19 bar pump, 25 second hot water ready function, removable 24 ounce water tank, buttons for espresso and lungo and the capability to hold up to 11 used Nespresso cups inside. The pixie comes with a welcome pack of 16 capsules of various aromas to get you started, so you can decide which your favorite ones are before buying your own. So if you have the extra money to spend and like Nespresso or Nespresso compatible pods, there is no better pod espresso maker out there. NB: The Inissia and Pixie are specifically for espresso making, but if you want the flexibility of having regular coffee as well and can up your budget by quite a bit, then consider the Nespresso VertuoLine, which we selected as one of our top picks for pod coffee machines. The KitchenAid Nespresso bundle can be considered the Cadillac and maybe even the best capsule espresso machine, and you’ll pay the price for this type of luxury. It comes in several colors, from red to steel, black, grey and white, and if there was ever an Espresso machine that was considered beautiful, the KitchenAid would surely qualify. This unit features a 44 ounce water tank and is wrapped in all metal construction. It is a heavy unit, but if durability is what your priority is, this unit won’t let you down. The Nespresso Bundle part of this package means that it comes with 16 different Nespresso capsules, so you can try several varieties, and it also comes with a milk frother if you like a cappuccino. There is also a selector dial which allows you to choose between espresso and lungo, as well as 6 levels of brew strength for each type. You’ll get hot water in less than 30 seconds and the LED light will stop flashing to let you know, a fully adjustable cup holder to accommodate virtually any sized cup or mug, a removable water tank and a disposal container that will hold up to 14 capsules. Make no mistake about it, this is not an inexpensive machine, but the quality of the espresso it makes rivals even the most expensive espresso commercial machines on the market. If you like the choice of using either the E.S.E pods or having the option of trying out your own brew, the De’Longhi Pump Espresso and Cappucino Maker gives you that choice of an espresso machine with pods and bar pump capabilities. The filter system converts to either a regular coffee-like filtration system that allows you to use any type of ground espresso that you desire, or convert it to a pod holder so that you can use the very popular and easy to use E.S.E pods. That choice is yours. The attached jet frother swivels so you can easily make a good cup of cappuccino as well and set a different temperature for that, as there are two separate thermostats. The only slight problem with using this frother is that you can’t fit a regular tall pitcher under the nozzle. However, this 12 ounce frothing pitcher will fit really well. The 15 BAR pump is capable of pumping out two cups of espresso at once, and the adjustable cup holder allows two cups to be filled at the same time while the base keeps them heated as the espresso is dispensing. There may be some vibration while it’s working so it’s a good idea to not leave it at that time. The removable 35 ounce water tank gives you enough water for several cups of espresso, and it will be ready to go in about 45 seconds. The unit self primes, so your next cup of brew will ready to go almost immediately. There is even a selector dial on the front that allows you to choose between frothing for cappuccino and espresso making, and the unit takes apart for easy cleaning. The maintenance required for it is really simple. This is probably the best value dual capable machines that you’ll find anywhere, and the espresso that it makes either way is first rate. This machine will not make a lungo and you can only fit an espresso sized cup here, but you can place two cups side by side to be filled. You also might want to get a separate good metal tamper, as the built in one isn’t very good. The Capresso Pump Espresso and Cappuccino Machine is also capable of using regular ground espresso or ESE pods, but in all honesty, it works better with your own grounds. It features an “on/off” button, and selector dial that allows you to choose between espresso and frothing/steaming. It comes with two sieves to choose between one or two shots of espresso. There are two spouts that dispense at the same time, so you can either fill one broad cup set right in the middle or two small cups side by side at the same time to get two shots in total. If choosing just one shot of espresso, there is a smaller sieve that should be used instead and this is also the one that is designed for use with pods. The bigger sieve works best for grounds in the porta-filter. If frothing or steaming milk, there are two positions to choose from depending on whether you prefer a steamed latte or a frothed cappuccino. The 46 ounce removable water container is the largest on this list, it will produce hot water in about 40 seconds with its steel lined ThermoBlock heating system, and it gives a solid 15 BARs of pressure. The milk frother easily swivels into place for use, the machine is relatively easy to clean, and the cup platform is heated so that your espresso stays hot all the time. But again, although designed to use ESE pods, you might find that the shots are a bit weak compared to ground coffee. You may be able to compensate by using coffee pods that you can fill yourself, making sure there is plenty of ground coffee filled into the pod, but the reality is, it just works better with ground coffee poured into the porta filter. The Capresso EC100 does make a fine cup of espresso on it’s own merit, but it costs a bit more than the Delonghi above. However, neither of these machines are designed to be used for heavy espresso drinkers fro more than a year or two. If you think you’ll need more than 3 or 4 shots a day and don’t want to buy a new one for a few years, then you’ll have to increase your budget quite a bit more.